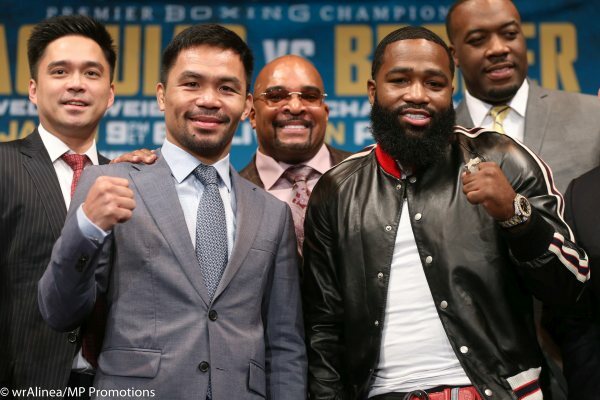 Adrien Broner’s coming fight on January 19 (January 20 in Manila) against Manny Pacquiao is, without doubt, the biggest in his prizefighting career. It could also be his biggest problem, bigger, no doubt about it, than the cases he’s facing nowadays. That is if members of the World Boxing Association welterweight titlist’s coaching staff, headed by chief trainer Buboy Fernandez, conditioning mentor Justin Fortune and assistant trainers Nonoy Neri and Roger “Haplas” Fernandez are to be believed. Buboy, for one, when he announced as early as last week that his bosom friend from way back their childhood days in Barangay Labangal in General Santos City, likened Pacquiao’s current condition as when he was beating the hell of his opponents upon moving to the 147-pound division from lightweight. The likes of legendary Oscar De La Hoya, Ricky Hatton, Miguel Cotto and even super-welterweight (junior-middleweight) Antonio Margarito. “Manny’s punching power today, his hands and footwork, at utak nya sa laban ay maihahalintulad mo noong mga panahong iyon. If not better,” Buboy told this writer after watching his ward spar for 12 rounds. Buboy and Fortune attributed their success in transforming their pupil’s new image to the training formula the training team drafted and implement putting premium on the eight-division champ’s capacity to absorb punishment based on his 40-year-old frame and what he likes. “It’s actually a matter of respect to one another. Kung ano gusto nya, binibigay namin, kung ano ang gusto namin, payag naman siya. We understand and respect each other, in other words. There’s no boss, no student. Whatever is best toward achieving our target, follows,” Buboy explained. Six months, for instance, after crowing himself the World Boxing Council lightweight champion at the expense of defending titleholder David Diaz via a ninth round KO on June 28, 2008 to become the only Filipino and first Asian to emerge belt-owner in five-division. 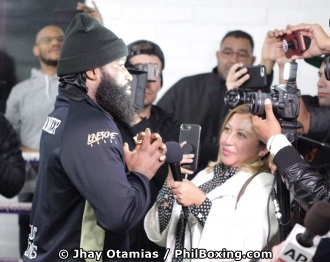 He moved up a division higher to face De La Hoya in his first fight as a welterweight dominated the showdown titled “The Dream Match” that after eight rounds, the Olympic gold medalist’s corner threw in the towel signalling the end of his colorful, successful career. In May the following year, the former unheralded Filipino dropped back to super-lightweight to challenge lineal junior-welter king Ricky Hatton, who, at that time, had won back-to-back wins after being stopped by Floyd Mayweather Jr.
Pacquiao was at his most devastating best in scoring the most awesome KO win of his career, a single shot blow that left Hatton out cold a the center of the ring. It was Ring Magazine’s “Knockout of the Year” for 2009. Novemner 14, 2009 saw Pacquiao demolished Cotto via a 12th round TKO in an encounter billed as “Firepower” to add the World Boxing Organization 147-pound diadem to his collection, his seventh. He, too, brought home the WBC Daimond Championship belt. After the fight, promoter Bob Arum declared “Pacquiao is the greatest boxer I’ve seen and I’ve seen them all – Ali, Hagler and Sugar Ray Leonard. That Pacquiao triumph triggered the five-long year negotiations for him to eventually meet Floyd Mayweather that cam into fruition in 2015. Exactly a year later on November 13, 2010, Pacquiao became the only human being in the history of sweet science to win championships in eight weight division beating Margarito to pulp in a 12-round scrap that should’ve been stopped in the early rounds. Pacquao came up the ring outweighed by 17 pounds but still came up with a dominant performance, inflicting Margarito a career-altering eye injury in the process breaking his orbit. Can the fighting Philippine senator still repeat these scintillating show of power 11 years after they happened? The answer is yes, if you ask Buboy and company or wait till Saturday (Sunday in Manila) when Pacquiao square off with the “Problem” kid from Cincinnati at the MGM Grand Arena.